Sting & Shaggy: The 44/876 Tour - Kicks off Sept. 14th, 2018 - TheUrbanMusicScene.com | Concerts & Festivals! Kicking off in Miami ‪on September 15 at The Fillmore Miami Beach, Sting & Shaggy: The 44/876 Tour will make stops at various venues along the way including Atlanta’s Tabernacle, The Theater at MGM National Harbor in Washington, Chicago’s Aragon Ballroom, plus additional Fillmore plays in both Philadelphia and Denver, before culminating at The Wiltern in Los Angeles ‪on October 15 (full itinerary below). Tickets will go on sale to the public ‪beginning Thursday, May 24 at 10am local time(s) at www.ticketmaster.com and usual outlets. Every online ticket purchase includes one physical or digital copy of Sting and Shaggy’s album, 44/876. Members of the official ‪Sting.com fan club will have the opportunity to purchase tickets in advance ‪beginning Monday, May 21. Please visit www.sting.com/tour for details. 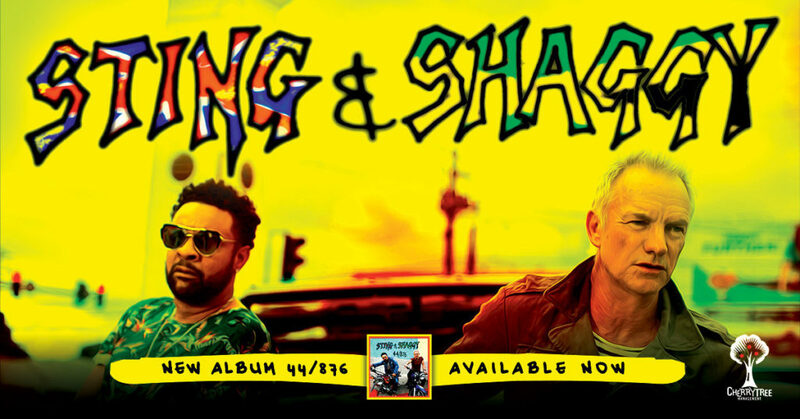 Along with continuing each artist’s exploration of reggae and its transcendent rhythms, songs like “Don’t Make Me Wait,” “Morning is Coming,” and “Gotta Get Back My Baby” reveal Sting and Shaggy’s shared passion for creating timeless music that defies expectation. ‪On May 25‪, 44/876: The Remixes will be released on A&M/Interscope Records, featuring an albums’ worth of remixes of songs from their album by a diverse range of artists including Chris Baio of Vampire Weekend, the Brazilian duo Tropkillaz, Cherry Cherry Boom Boom (Madonna, Lady Gaga) and Grammy-award winning producer Dave Audé, among others (track listing included below). Sting and Shaggy will be joined on the 44/876 Tour by Sting’s players ‪Dominic Miller (guitar), ‪Josh Freese (drums) and Rufus Miller (guitar) as well as Shaggy’s band members Melissa Musique (backing vocals), Gene Noble (backing vocals) and Kevon Webster (keyboards). The tour is produced by RZO Entertainment and promoted by Live Nation Global Touring.